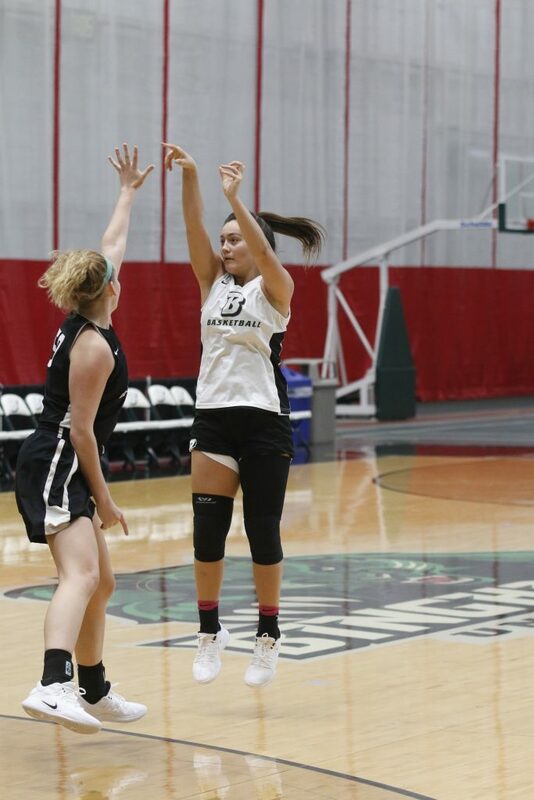 If hype could predict the future, freshman guard Annie Ramil will be the next star of the Binghamton University women’s basketball team. Ramil, a Binghamton native, joined the Amateur Athletic Union (AAU), a nonprofit volunteer sports organization, in the seventh grade. As a guard for the nationally ranked iExcel AAU program, she earned a reputation as a spot-up shooter that thrived at scoring from beyond the arc. In Ramil’s illustrious basketball career at Binghamton High School, she scored over 1,000 points, almost 900 of them coming in just her junior and senior year alone. In her final two years as a Binghamton Patriot, Pressconnects named Ramil to its Elite 10 All-Star team. She was chosen to the Southern Tier Athletic Conference West/Metro all-conference and all-division teams and represented her school on the 2018 BCANY Section 4 all-section team. As a high school senior, Ramil averaged 21 points and 15 rebounds while scoring 437 total points. In March, she was named the Binghamton Girls Basketball Player of the Year. At the end of the season, she was ranked No. 125 in New York girls basketball. As evidenced by her rank as team captain on the high school squad, Ramil cited her leadership skills and accountability as her biggest strengths. Ramil played all over the court, and her play stepped up when one of her teammates tore her ACL. As a result, she was double-teamed more often. Ramil said that this spotlight won’t have to follow her to BU. “I don’t think I’ll have to [play several positions] because our team is stacked with players that are very versatile this year,” Ramil said. Ramil was named an NYSPHSAA Scholar-Athlete for the 2017-18 scholastic year and is a member of the National Honor Society. This bodes well for her ability to adapt to college-level academics. However, the freshman said her transition into collegiate basketball will be smoother once she improves her shooting and ball-handling skills. She also mentioned talented college athletes as a reason to refine her talent. Ramil will be playing Division I basketball alongside her older sister, sophomore forward Olivia Ramil. Playing with her sister will provide the younger Ramil a sense of comfort in her acclimation to college basketball. She says her two older sisters also taught her how to be an older sister for her three brothers. Family is of the most importance to the entire Ramil clan. She credited her parents Mike and Brem for teaching her a strong work ethic and shaping her into a mentally tough athlete and person. The Ramil family has numerous tough athletes on the family tree. Ramil’s father and uncle both played football at the University of Alabama and her grandfather played at Auburn University. The whole family gets together every Sunday to watch a slate of football games. The Ramil family’s tight bond and its football fandom are on display during these weekly occurrences. The high school star grew up also watching NBA games. She became a big fan of Kobe Bryant, but took notes on the way an older NBA legend played. According to Ramil, watching Basketball Hall of Famer Charles Barkley positively impacted her development as a basketball player. She emulates his strength taking the ball off the rim and crashing the glass. Similar to Barkley’s ability to play as both a guard and a forward, Ramil’s long wingspan and height permit her to aggressively corral rebounds, as well as run the floor. While she may not engage in extracurricular activities after the whistle as did one of her favorite professional players, expect Ramil’s presence and tenacity to be felt in her first season.